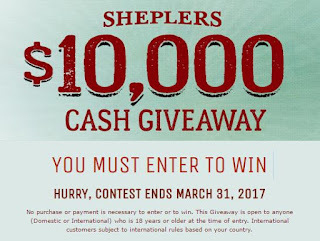 If you don't mind signing up for the mailing list to Sheplers, they're doing a $10,000 cash giveaway. This is open worldwide, excluding HI and AK for some reason. Actually, re-reading rules, you aren't required to opt in... single entry. Ends 3/31. Good luck.